Sports - The Fan's Take: Announcers of Yester Years! I grew up listening to Ernie Harwell during the 1980’s through his retirement and during this time he was still mainly radio, but he did some television and I just loved his voice and his off- the-wall comments. “He stood there like the house by the side of the road and watched it go by” or my favorite “Foul ball: Caught by a man from…”. When I was much younger, I always wondered how he knew where the person was from; finding out later that he didn’t which, was like finding out Santa Claus didn’t exist. During this time I would argue with anyone on this topic that Ernie was the best, till 2011. In 2011, I signed up for the MLB package and that year I finally heard Vin Scully announce a game. I finally knew why he is considered arguably the number one announcer of all time. With his voice and storytelling, I felt like I was back when radio was king and every boy had a transistor radio listening to the game. Even though the game was televised and on the television, I didn’t have the need to watch the game, just listen to it. When I heard Vin was coming back for a 65th year, I was pleased, but also sadden. Who will be considered the voice of baseball or any sports in my generation? 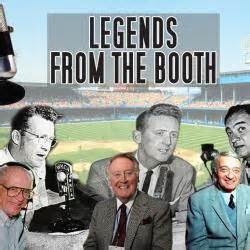 Does my generation have a Vin Scully, Jack Buck, Harry Kalas, Harry Carey, Mel Allen, Red Barber or Ernie Harwell? Unfortunately, my answer is no. The current generation of announcers are good, but they don’t have that “Welcome, put your feet up and stay awhile” voice. Why? Just the changing of time, all of the greats that I listed above broke into announcing through radio. Radio announcers had to use words to create a picture for their listeners. When Norm Cash hits a home run and when one hears Ernie yell its “Loooong gone”, the person on the other side of the radio could feel the excitement and also could see it through the announcer’s eyes. Announcers of today don’t show that same passion that the announcers had in yester years. Why? The culture of sports and the world has changed. Sports are big business, with high dollar contracts and high maintenance players and in today’s world, everything needs to be politically correct and every word that is said gets analyzed. If one wrong word is said on the air or internally, even with no bad intentions meant, more time than not the person uttering those words will be fired. This is why there won’t be another great announcer, so Mr. Scully thank you for a 65th year and there won’t be another one like you. You are the last voice of yesterday and you carried it on so well for Jack, Harry, Mel, Red and Ernie.